Long ago I had a friend from from Vicenza Italy who was one of my greatest cooking influences. Every sunday several of us would gather around his table to enjoy perfectly prepared northern italian meals. Undoubtedly I was inspired by his delectable dinners, however, he didn’t “teach” me a thing about cooking. As a young aspiring cook I wanted so badly to be involved in his kitchen. I think he wanted to keep his ingredients secret because he wouldn’t allow anyone near while he was cooking. He would chase you out as soon as you made an appearance. Although he didn’t teach me about cooking, I learned a great deal about food and cookery just by being present around his table. This recipe features spaghetti with garlic and olive oil, also known as spaghetti aglio e olio. I vividly remember having spaghetti aglio e olio for the first time. I was mesmerized. Up until that point spaghetti for me was tomato sauce with ground meat either cooked in the sauce or made into meatballs. The simplicity of this sauce makes it so easy to throw together. Most of the time I already have all the ingredients in house. In my opinion, the sauce relies on a good quality spaghetti. Try to buy the best brand from Italy you can find. 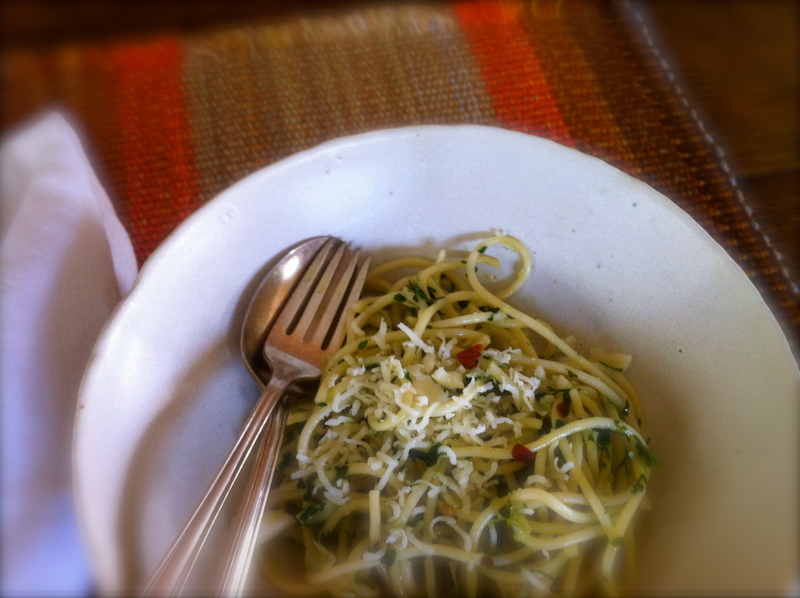 Aglio e olio is profoundly satisfying served in a large bowl with freshly grated parmesan. Or, ripieni di pomodoro is a pleasing arrangement for guests as a side dish. If you choose to make the tomato stuffed recipe it is best to buy capellini, also know as “angel hair” pasta. Fill a large pot with cold water and bring to a roaring boil over high heat and add the spaghetti. Cook for 9 minutes stirring occasionally. While spaghetti is cooking, Heat the olive oil in a large skillet over medium heat. Add the garlic, and chili flakes. Cook until golden and turn off the heat. Drain the spaghetti and place it into the skillet. Carefully toss the pasta until every strand is coated well. Add the parsley and continue to toss until well incorporated. Divide into large serving bowls, sprinkle with parmesan and serve right away. Follow this recipe if you choose to make the stuffed tomato version. Fill a large pot with cold water and bring to a roaring boil over high heat . While you are waiting for the water to boil chop all your ingredients and set aside. Cut the tops of the tomato off 1/4 way down. Scoop out the inside. Set aside. When the water boils and before you add the capellini, heat the olive oil in a large skillet over medium heat. Add the garlic, and chili flakes. Cook until golden and turn off the heat. Now add the capellini to the water and boil for 2 minutes. Reserve 1/2 cup of the pasta water. Drain the capellini and place into the skillet. Carefully toss the pasta until every strand is coated well. Add the parsley and continue to toss until well incorporated. If your pasta seems to be dry add a little of the cooking water to loosen it up and to moisten. 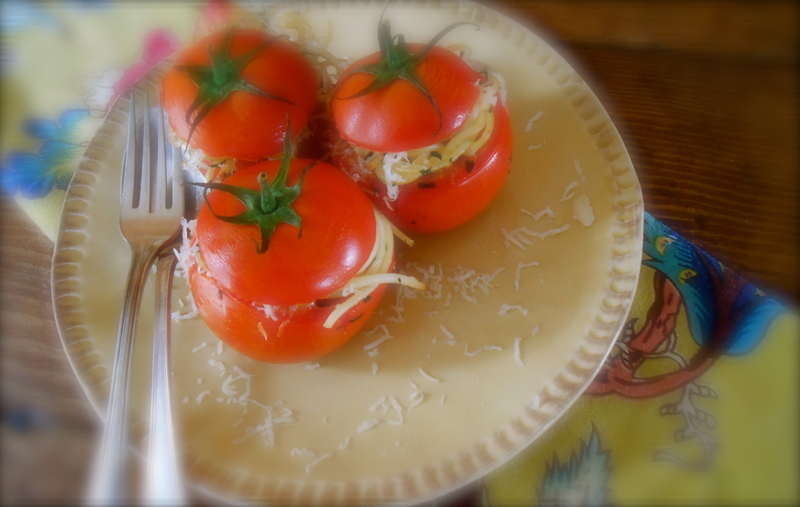 Fill each beefsteak tomato with your capellini aglio e olio. Put the tops back on and bake for 15 -20 minutes until the tomatoes are tender and cooked. Serve promptly with a sprinkling of freshly grated parmesan. Me too… I am so fond of spaghetti I could eat it everyday! Please, keep reading. :) I appreciate your comments. I love them! LOVE agio e olio so simple but totally delicious. Your ripieni are beautiful, another one of my favorites and a dish I will look forward to when the beautiful late summer tomatoes hit the markets. Everything looks so so good. Thank you Suzanne! These particular tomatoes were fine but, awww, the late summer tomatoes are unparalleled. I can’t wait. I love the presentation! I’ve only made stuffed tomatoes with white beans before, but it has never once occurred to me to stuff tomatoes with pasta… yum! My favorite pasta is cappelini, but I have never seen it this way in a tomato! Now this is different! So cute! You are currently reading spaghetti aglio e olio stuffed tomatoes (ripieni di pomodoro) at COTTAGE GROVE HOUSE.